Before this writer goes on about the above title I have to confess WBA, WBC and IBO Middleweight Championt Gennady “GGG” Golovkin is my favorite boxer today. Prior to their first meeting I felt “we have the best 154 lb. boxer in Alvarez, 47-1-2, and the best 160 lb. boxer in Golovkin, 38-0, fighting one another back in September of 2017. Both boxers would or should be in anyone’s top 10 pound for pound list. For the better part of five rounds the fight was living up to its hype. Then starting in the sixth round Alvarez no longer went to war with Golovkin but started moving away and counter punching in this writers eyes. It did not make for a second half of the fight a possible “fight of the year” contestant. Then after the 12 rounds were completed came the judge’s scores. I had it 116-112 for Golovkin and certainly felt he would get the decision. Scores read Adalaide Byrd 118-110 for Alvarez. My disbelief in her score put me almost into shock! What fight was she watching? Dave Moretti 115-113 for Golovkin. Closer to my score so fine. Don Trella 114-114 a split decision draw! I understand Trella may be one of the judges in the rematch who voted a draw in their first bout. Alvarez had jumped up on the ropes at the ring corner with hands held up at the end. I thought “is he celebrating he went the distance with GGG?” That should have been my first clue “wait until you hear the scores of the judges”. After the decision was announced Golovkin stood there in disbelief the same way I did from my chair having watched and heard the final decision. I thought the March of 2017 bout Golovkin had with Danny “Miracle Man” Jacobs, 32-1, gave GGG a better fight than this though I still felt GGG won. Skipping the day of the fight weigh-in Jacobs probably came in at 180 since GGG weighed in at 170 from his 160 the day before the fight. Plus Jacobs fought southpaw for in my memory he never fought before. Now, there was a reason for a rematch if there ever was one. The IBF did not recognize this fight because of Jacobs skipping the second weigh-in. 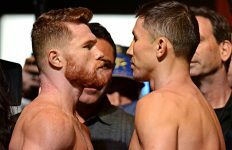 After the Golovkin-Alvarez fight it is normal for both fighters to take a urine test to see if there were any banned substances in their urine. So why since September 16, of 2017 when this was done there were no traces of Clenbuterol that did appear at an April 18th 2018 test in a Mexican county near where Alvarez lived just prior to the original rematch of May 5th? The Nevada commission on hearing the results of this test suspended Alvarez for 6 months which meant on August 17th he could return to the ring. So without Alvarez now eligible to fight for 6 months the Golovkin camp scrambled for an opponent to replace Alvarez. I was only aware of two boxers that agreed to fill in. One was 2004 USA Olympian Vanes “Nightmare” Martirosyan, 33-6-1. The same Olympics Golovkin won a Silver Medal for at Middleweight. The other was 2008 USA Olympian as a welterweight Demitrius “Boo Boo” Andrade, 25-0, now scheduled to fight WBO Middleweight champion Billy Joe Saunders in October. He also defeated current unbeaten WBA Welter champ Keith “One Time” Thurman twice in the 2007 Olympic team trials. As a matter of fact Golovkin had hoped to fight Saunders after his fight with Jacobs down the road in order to have all five belts including the IBO. He also has lost his IBF title due to the fact since he is fighting Alvarez and not the IBF’s No. 1 contender Sergiy Derevyanchenko. I understand that No. 3 ranked Jacobs will meet No. 1 for the vacant title. No. 2 is vacant. Another question is “why wasn’t the draw decision changed to either a No Contest or No Decision due to Alvarez flunking his drug test? It’s the only time I am aware of this not automatically happening. So now on the eve of the Golovkin-Alvarez II match this Saturday we see the PPV price at about $89.95 instead of the much lower PPV pricing in the past. Someone is making a killing on this amount. Would you believe Alvarez promoter Golden Boy Promotion’s Oscar De La Hoya is? I’m glad that Golovkin can get most likely his biggest purse in this upcoming fight but the humiliation from the Alvarez camp mainly from de la Hoya is not worthy of criticism toward Golovkin. 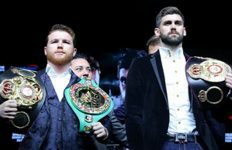 De La Hoya again predicts an Alvarez knockout. The fight is to be held on Mexican Independence Day. Alvarez who won and gave up the WBC title he won from Miguel Cotto and in including that match never fought over 155 except in his fight with Julio Cesar Chavez, Jr. realized he is not a middleweight but a super welterweight. On so many levels how this first match between the two came about to me is a mystery. After Golovkin the Jacobs fight six months before this. Jacobs since his defeat has defeated a pair of unbeaten boxers since. The hype on this upcoming fight with Golovkin and Alvarez has reached a high pit level with the bad mouthing coming from the Alvarez camp including De La Hoya. My hope and prediction is Golovkin will send Alvarez through the ropes into the lap of De La Hoya before he runs to the box office counting the ticket sales. All things aside the publicity on this rematch seems to be giving boxing a needed shot in the arm. Would you believe this writer will not be viewing it but covering a fight in Hockessin, DE, that night?